The Federal High Court in the Nigerian capital Abuja has adjourned proceedings brought by the detained leader of the Islamic Movement and Nigeria and his wife seeking to enforce a court order for their release. The adjournment came as supporters of Sheikh Ibrahim el-Zakzaky marked his 66th birthday with a procession in the city of Kaduna. 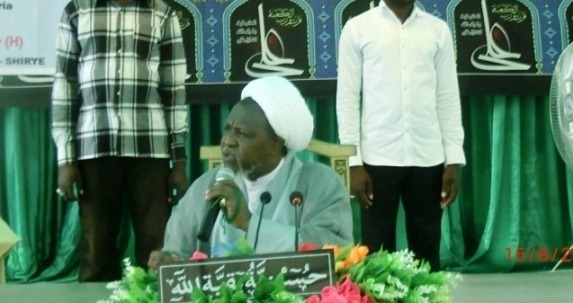 Together with his wife, Zeenah, the sheikh has been held without charge and mainly incommunicado following their arrest during a savage military assault against the Islamic Movement of Nigeria (IMN) in December 2015. Both were shot during the attack in Zaria in which at least 1000 IMN supporters, including three sons of the couple, were killed and many properties and religious spaces belonging to the IMN and its followers destroyed. Sheikh Zakzaky has also already lost the use of an arm and one of his eyes and his aides fear could lose his sight completely if he doesn’t receive the urgent medical treatment he requires and which the government has so far denied him. The couple remain in the custody of the State Security Service which is stubbornly refusing to implement a release order issued by a federal high court judge on 2 December 2016 on the basis that their detention is illegal and unconstitutional. The judge gave Nigerian authorities 45 days to unconditionally release the pair. However, nearly four months have passed since the deadline with no sign that the authorities are ready to execute the court order. Despite several appeals by Lawyers and supporters of Sheikh Ibrahim el-Zakzaky to President Buhari, the Attorney General and the Minister of Justice the Zakzakys continue to languish in detention with no end in sight to their ordeal.